One of the core questions for a fund is about its investment strategy. We have previously published our asset allocation strategy. The fund invests directly into established crypto currencies with at least 100m USD market cap that are listed on at least three major exchanges. The fund also invests in selected ICOs. The fund acquires crypto currency that meets above criteria from third parties (for example at bankruptcy auctions) when there is a discount of at least 5% vs the lowest exchange price. The fund will also invest in mining operations. Revenue generating domains (from parking or advertising) are acquired at max 30x monthly multiple (ttm). Domains are valued based on comparable sales, keywords, and automated appraisals. This also includes names based on the Ethereum Name System (ENS) or similar systems. 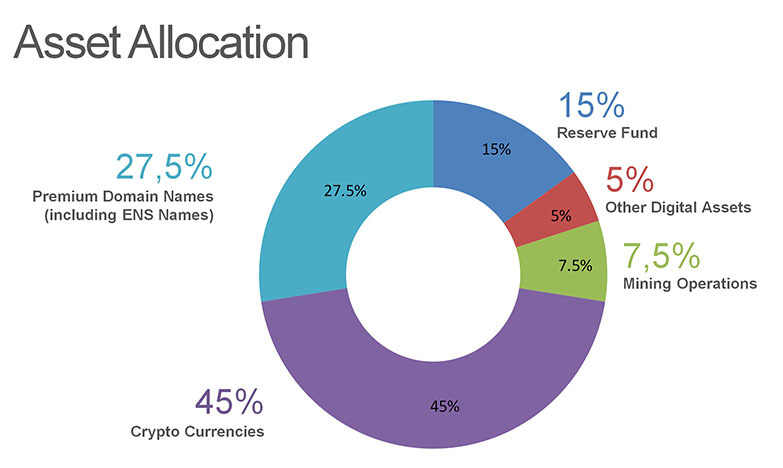 15% of ICO proceedings is held in a reserve fund of min. 25% BTC, min. 25% ETH and max. 50% cash. Potential investment assets are identified by our research team and vetted by the asset manager and the fund’s director. From the ICO proceeds, we have allocated 15% to operations; part of this will be used to increase the research team. Currently, we already have a team of domain research experts in Skopje, Macedonia. These experts have built the technology for our partner DomainIndex.com. Using DomainIndex.com, we can track the development of price levels in the domain space; it also has technology to identify undervalued areas in the domain space. Across all digital assets, we have a proprietary criteria matrix containing over 130 items called Multi Input Digital Asset Screening (MIDAS) that ranks assets in terms of risk and potential returns. We are constantly adapting to new terms of digital assets that come into the market; for example, six month ago, ENS did not exit. In the domain, MIDAS criteria consist of (among others: keyword searches, keyword frequency, keyword citation frequency, number of TLDs taken, comparable sales value, automatic programmatic appraisal, TLD stability, TLD legal risk, etc. For crypto currencies, MIDAS criteria include: market cap, average daily trading volume, total coin supply, total circulating supply, max coin supply, order book depth, technology risk, 30-60-90 day social media sentiment. In ICOs, from a bird’s eye perspective, we look for experienced teams that have a history of execution and deep industry roots; for a capitalization that is realistic and will enable profits to investors; for solutions to real world problems targeted at specific industries or markets. In general, the fund holds mid to longer term and does not engage in day trading. In crypto currencies and ICOs, we select targets and rank them according to a combined alpha factor. Given the rankings, we stay in the top percentile and sell the bottom percentile once every re-balancing period. Smaller parts of the crypto portfolio may be allocated in the future to day trading through partnerships with technology providers in this space. By principle, the fund steers clear of assets that potentially infringe intellectual property rights, network schemes, and other dubious opportunities. Out mission is simplify investing and make it more accessible and safer to invest in digital assets. Our task is to do the hard work in research in due diligence, so that our investors don’t have to. It’s like having your personal asset manager handling your digital investments. 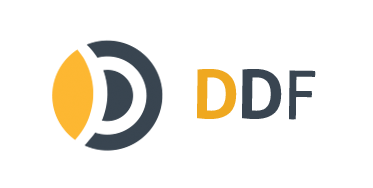 If you would like to take advantage of our service, join our fundraising ICO and become an investor in DDF.